Camping and hiking in the rain and wind. Not exactly my idea of a good time. But, this is Patagonia in the springtime. To see the true nature of Torres del Paine National Park is to experience it with all your senses. 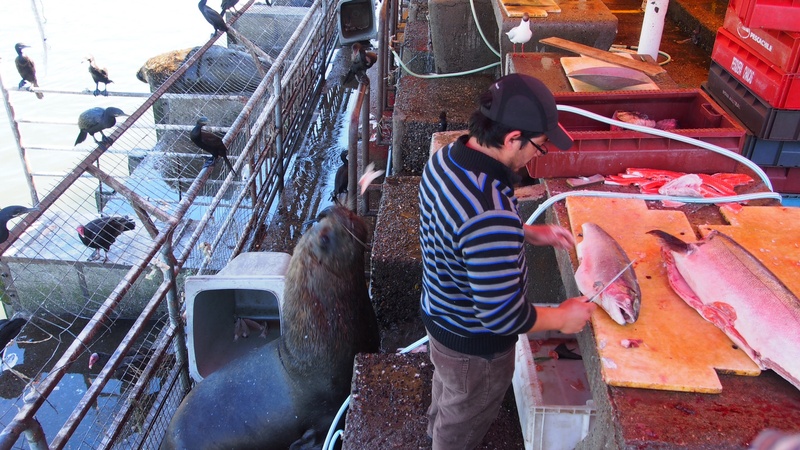 I write now from a comfy bed in a hotel in Punta Arenas on the Straits of Magellan, 24 hours after leaving the park. The Paine Massif is not a part of the Andes Mountains but a separate group of massive granite peaks rising at sharp angles out of a relatively flat plain. The area features peaks, rivers, lakes, glaciers and abundant wildlife. Oh, and enough technical outdoor wear to clothe a small nation. 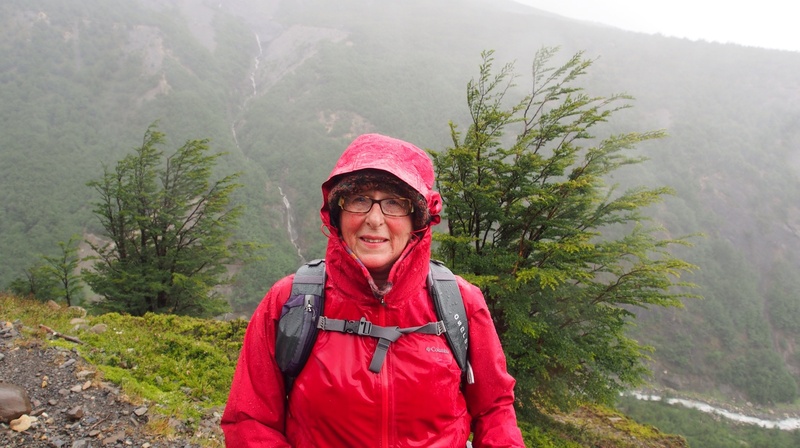 On day 1 we bussed from Puerto Natales to a campsite at Refugio Chileno. The Refugio offers bunk style accommodation and meals to both campers and bunk-room inhabitants. The plan was to dump our gear in our pre-erected tents then do a hike. We should have taken it as a sign when the space between the mountains, where we should have seen a few 2600-2800 meter granite towers, was shrouded in a thick white fog. It was spitting with rain as we prepared to start walking but we proceeded on the chance that it could change. We hoped to do an 8 hour, there and back, hike called the ‘Tower walk’. Few people were on the track and many had turned back when it became evident that it wasn’t going to clear. We walked uphill about an hour and a half and came to a crest where the wind was travelling at 80 kilometers an hour or more. It really was sad to have to turn back but we knew there was a ledge that had to be traversed and the thought of going off a cliff in high winds did not appeal. A disappointing start. Soaked and disheartened, and me with a sore knee, we headed back to the Refugio. On the positive side, the Refugio offered a place to dry out by the fire and there was alcohol. We stayed indoors watching the clouds and mist covering the pointy towers from the safety of the fire. It was hard to drag ourselves outside to our tent on the other side of a very swollen river. The tent was barely big enough and not really level, so we spent a restless night on the ground and woke early. Breakfast was at the Refugio and when Andrew went to ferry bags across the river he encountered two bridges pretty much washed away and a road that had to be forded in ankle-deep water. Fortunately, there was a swish resort nearby that must maintain a further road bridge for private vehicles. We were able to detour down stream a bit and get to the cozy Refugio for brekky. On day 2 we took a shuttle bus and catamaran ride across Lago Pehoé to the campground at Refugio Paine Grand where we would spend the next two nights. The scenery from the bus and ferry were both incredibly grand. This landscape is just so BIG! 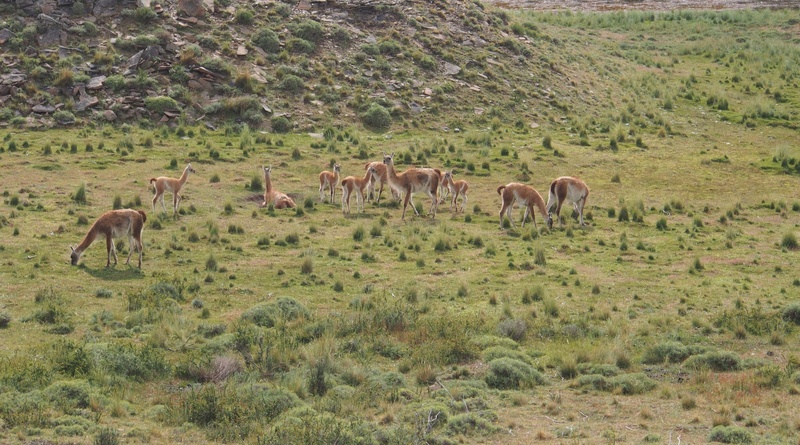 We saw wild Guanacos grazing on the open hillsides, sometimes lone bucks, and sometimes groups of females with young animals. The back side of some of the towers were visible even through the light misting rain. The walk planned for the day was about 6 hours total, there and back, and followed a trail to look out on Lago Grey and Glacier Grey. It looked pretty miserable out and I decided that I didn’t want to get soaked again so I opted out of walking. Andrew went with the other walkers and from the safety of the Refugio I watched the towers cloud over and the rain come in pretty heavily as the day went on. Knowing his second pair of shoes would be getting soaked, I hoped his previous day’s hiking boots would be dry for day three and that he had the sense to turn back before ruining his leather shoes. He returned only slightly wet – fortunately the direction of the walk did not see the same rain as the side of the hill that I could see. A few beers and dinner followed. The Paine Grande Refugio must have been skimping on power and the building was cold during the day, but with a hundred or so lively souls post-hike, it got cozy enough that the thought of two more windy nights in a tent on uneven ground was pretty depressing. Plus the toilet block was a long way off so additional sedative doses of alcohol would have only meant middle of the night dashes in the rain for a pee! On day 3 we walked in the direction of French Valley. Two hours out and two back was all I wanted to attempt as my knee had given me a bit of trouble on day 1. The walk was along the shore of Lago Pehoé and the section we walked was gently undulating. Gusts of wind featured in a few spots and wildflowers were everywhere. Sadly, a forest fire a few years ago had killed off many of the trees, but the scenery was still stunningly beautiful. We refilled our water bottles from streams and little waterfalls, sat on rocky outcrops and munched on dark chocolate, listened to the birds twittering away, smelled the clear mountain air, watched water funnels appear on the surface of the impossibly pale blue lake and admired the snow-covered granite peaks of the Paine Massif. This was the day of redemption for the two miserable ones we had experienced. The pictures tell it all. If you don’t camp regularly, fork over the $55 and get a bunk in the Refugio – don’t camp if you don’t want to be stiff and sore and tired. Stay longer so you can adjust your trekking plans to suit the changeable weather. Go. This is an ‘awesome’ experience, and I mean that in the most old school sense of the word. 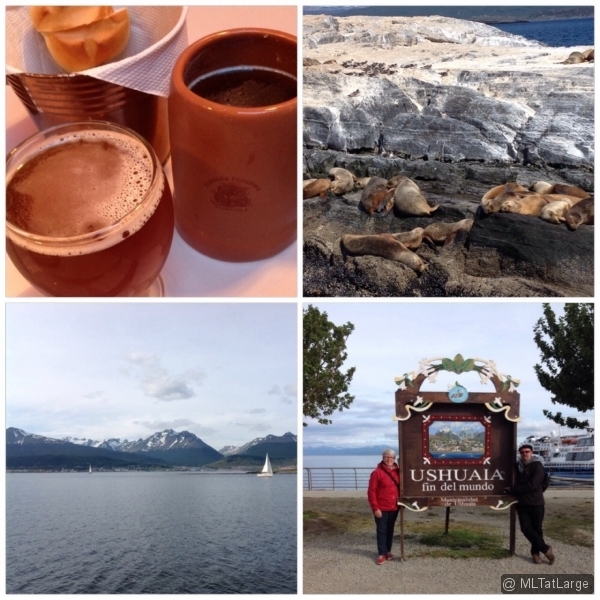 Next stop, Ushuaia. Tierra del Fuego. 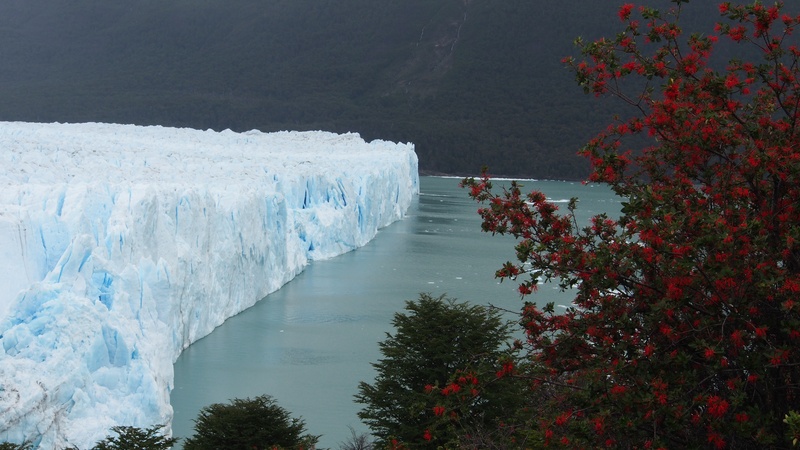 One of the main reasons most people come to this part of Patagonia is to visit some of the spectacular sights offered in the Glaciers National Park (Parque Nacional Los Glaciares). Yes, that’s plural, glaciers. 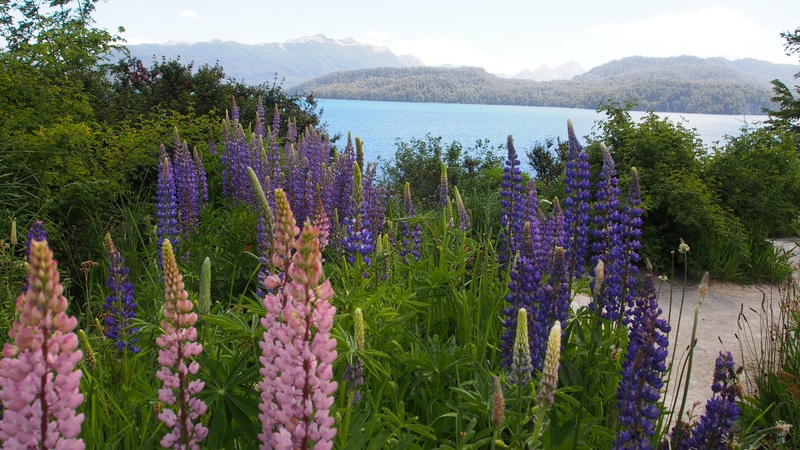 Mountains, glaciers and lakes abound in this beautiful part of Patagonia. 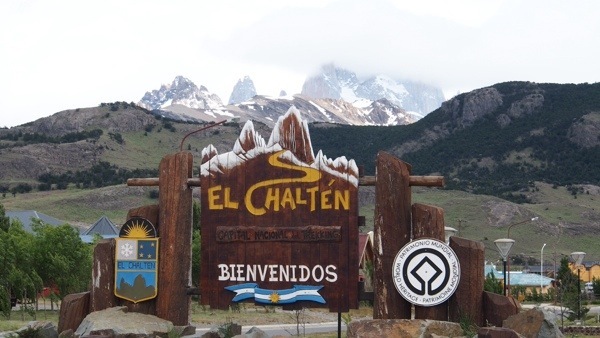 We visited the northern region first and based ourselves in the colourful town of El Chaltén. Only new, being founded in 1987, it has the feel of a frontier town in say, Alaska. There is a hodge-podge of building techniques and more than half the buildings look incomplete. There’s no mobile phone service and internet often reaches the dizzying speed of dial-up circa 1997. Friendly dogs roam the streets solo or in packs and there’s a proliferation of artisan breweries, shops selling hand knitted scarves and beanies, local pottery and the ubiquitous mate gourds (gourds for drinking your cup of Yerba Mate tea). Winter is long here and many hotels, hostels and restaurants close down from April to October. Rock walls of 100 meters or so, sort of enclose the town to the north and south and the Río Fitz Roy runs along the northern wall. From most points in the town you can see the jagged peaks of Cerro Torre and Cerro Fitz Roy. We met people from all over the world who had come to climb the many rock walls, peaks and ultimately the two big ones, Cerro Torre and Cerro Fitz Roy. Our goals have been slightly less lofty. I was merely satisfied to see the peaks from a lookout point that required a 3 hour trek to Lago Torre. The trek was not overly steep, nor did we gain more than 200 meters in elevation (from 600m to 800m). However the terrain was rough in places with littered rocks, perfect for twisting ankles, and huge boulders that we had to scale on hands, knees or bottoms! Fortunately the lookout was sunny, if a tad windy, and the glacial lake the most striking hue of pale, creamy turquoise. Fitz Roy itself had a cloud defiantly clinging to it for the whole hour we rested there. We hoped the wind would blow the wisps away but we had to wait for the walk back to see a bit more. And of course, we woke the next day aching – well, I was after 7+ hours of walking – to a perfectly clear view of the peaks. Because the weather was surprisingly good, Roo considered hiking partway back on the trail to get a closer look at the peaks, but reason prevailed and we did a shorter walk of three hours ‘ida y vuelto’, there and back, to two lookouts on the other side of town. The first was the Mirador de los Condores, from which we were lucky to see three condors gliding over the valley, and the second was the Mirador de las Aguilas. I don’t think we were intended to see eagles, but to have an eagle’s nest view over the huge Lago Viedma and the surrounding Fitz Roy river valley. No post is complete without some comments on the food we ate. I’m glad to announce that the hunt for good empanadas met with success on two occasions. We can recommend the spicy chicken and the spinach & cheese empanadas from a bakery on San Martin called Que-Rika! And the Patagonian Cordero (lamb) Empanada went down a treat at La Cerveceria (extra kudos for free popcorn with your beer)! From the Mirador de las Aguilas, looking over Lago Viedma. 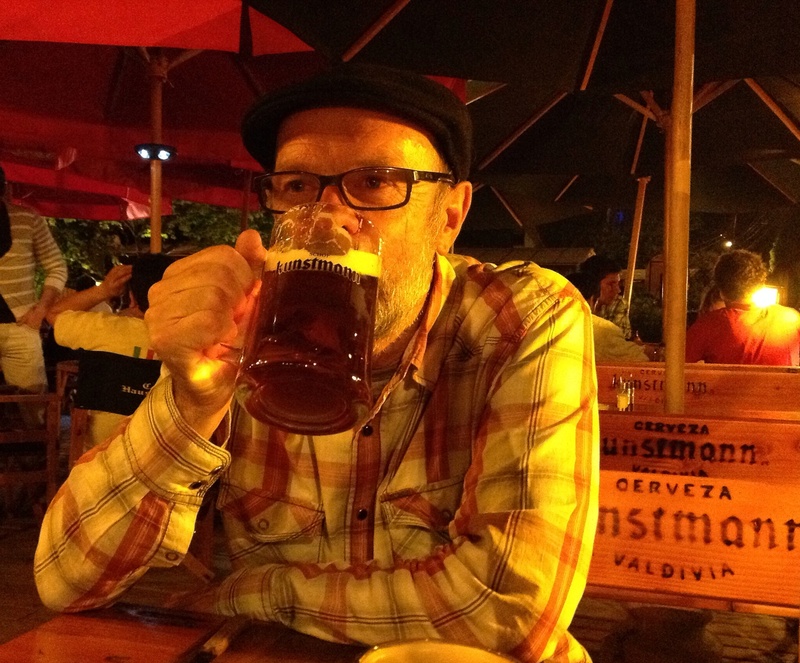 Beer and empanadas, a perfect pairing. A little Austrian- designed church dedicated to the climbers who have died attempting the peak climb. Clouded over view after 3 hour trek! Click an image to enlarge and view as slide show. We have been in the Lakes District for about a week now. One day we went up the teleferico to Cerro Otto and walked back down to town along a dusty but scenic route, stopping at a Refugio for some sustenance of beer and pizza. The next day we did a boat trip out on Lago Nahuel Huapi (this huge lake vies with the surrounding Andes mountains for dominance of the area) to Isla Victoria and to the Parque Nacional Los Arrayanes. 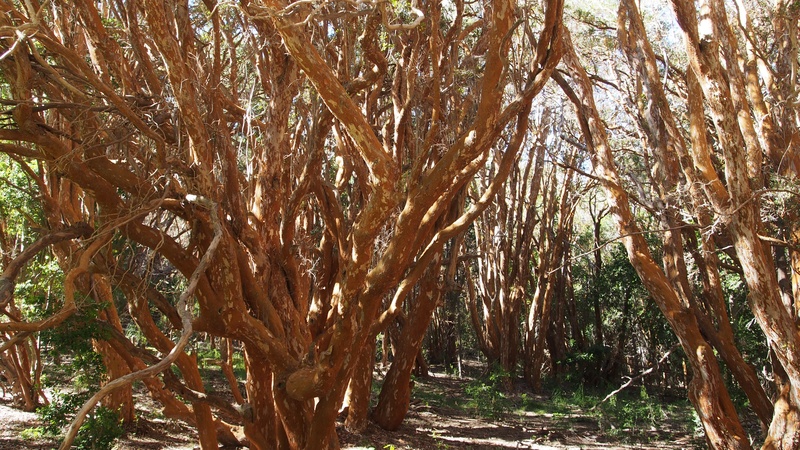 On a peninsula that sticks out into the lake from Villa la Angostura is the national park containing a ‘Bosque’ or forest of the cinnamon-barked Arrayán trees. It’s a fairly touristy exercise being shepherded off and on the boat and the trails, but worthwhile to see these beautiful indigenous trees. And our Guide from Turisur, the company we did the day trip through, was so knowledgable and friendly. I twisted my knee going down the narrow stairs of the boat and although the damage was only muscle and ligament strain, it was enough to scuttle our plans for a hike up Cathedral Mountain for an overnight stay at Refugio Frey. So we decided to adjust plans and instead rent a car to drive the 110 kilometer long Camino de Los Siete Lagos, or the route of the seven lakes, which takes you past the town of Villa la Angostura and on to San Martin de los Andes. We stayed two nights in San Martin so we could spend the day in between to drive another 110 kilometers to Parque Nacional Lanin. Half of the drive before you get there, you can see the snow-covered peak of the volcano Lanin on the horizon as you round bends in the road. It’s possible to ascend the volcano, but my leg was just healing after a few rest days, so we took it a bit easier and just walked 45 minutes to the base then back. On the way north we originally missed the turnoff and ended up 30 kilometers north and a bit west towards the Chilean border. The drive was beautiful though so maybe we will have to come back and, with a better rental car, do a longer driving trip in the far northern reaches of the Lakes District. I think my strained muscle is all healed so we will do a local hike tomorrow. 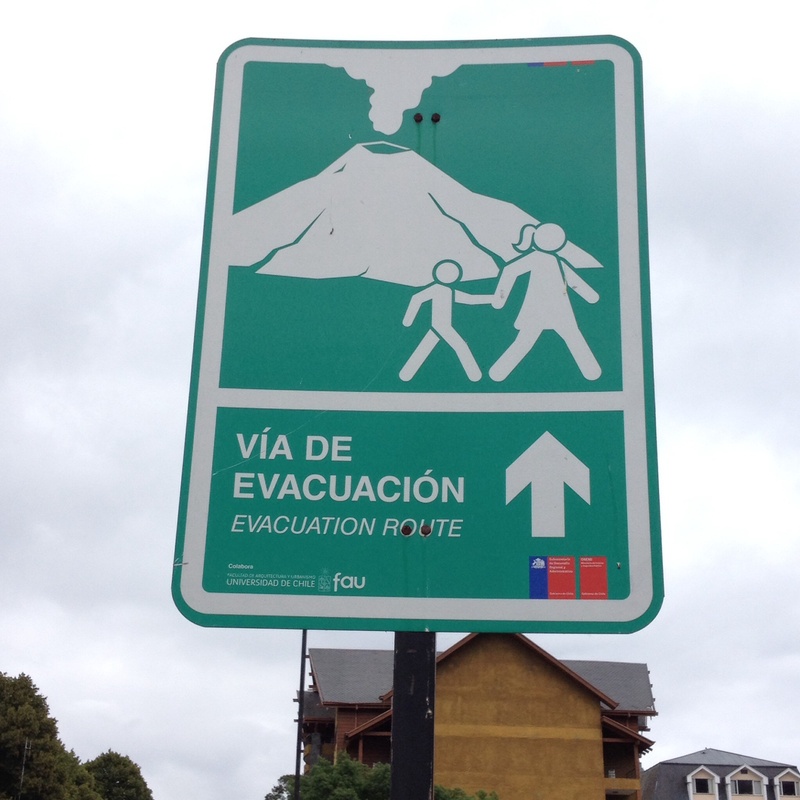 The more serious stuff will have to wait for our next stop – El Chaltén. We fly south on Friday. 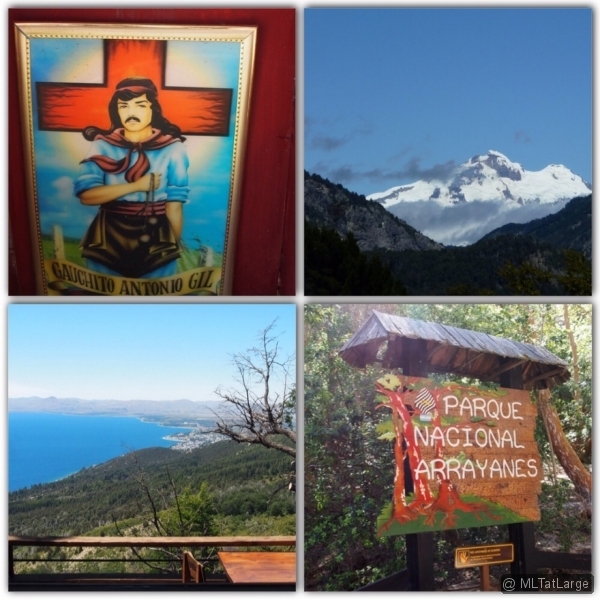 Meanwhile, below is an image gallery of some of the beautiful places we have seen over the last week around Bariloche and to the north. Click any image to start a slide show. The lakes district stretches along the Andes near the Chilean border. The heart is San Carlos di Bariloche, on the huge lake called Lago Nahuel Huapi and it’s bound on 3 sides by the Andes.There are numerous national parks in the region, all with unique landscapes and flora. It’s hard to imagine a more beautiful setting. On the highways the mysterious Gauchito Gil protects those who believe. 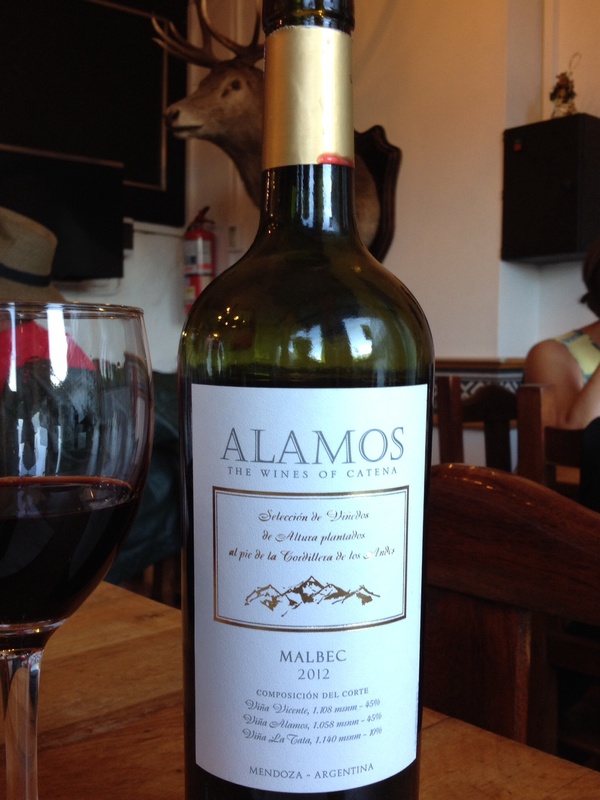 We travelled north by car to San Martin de los Andes and on to Lanin National Park. Stunning!